(1) Not sure about this one. A scientific instrument of some sort. Dates from around 1860 - 1880. (2) A seal for using on sealing wax. 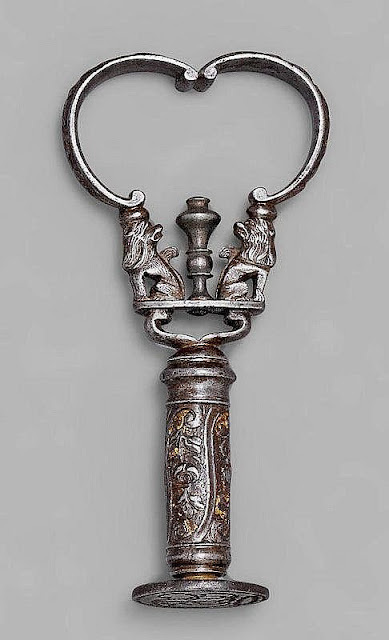 North European, circa 17th/early eighteenth century. (3) A new one on me. A very ingenious cycle, probably English, and circa 1860 to 1870. (4) This one puzzles me. 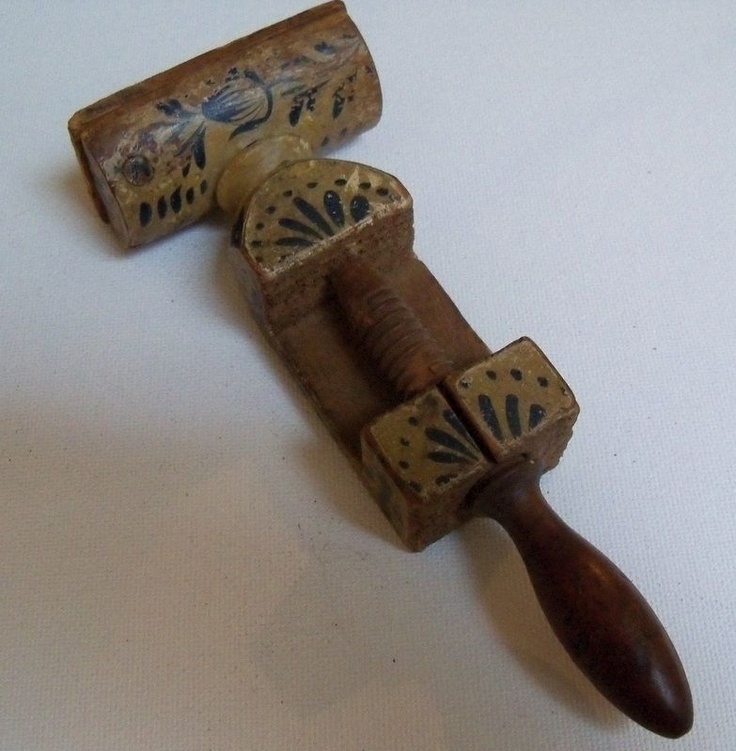 It appears to be a ball mould, but there are a few pointers that suggest otherwise, so I'll guess it's a nut cracker. 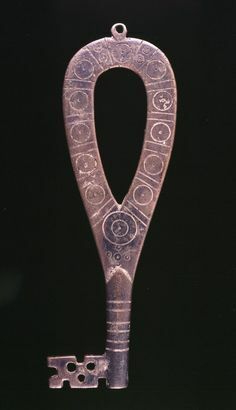 Bronze, English (?) circa 17th century, early 18th century. (5) Painted treen nut cracker. North European, early 19th century. (6)Fine quality betel nut cracker, Indian 18th/19th century. (7)Flintlock pistol/key. Used to be called gaollers' key/pistol. This one appears to be continental ? French, and 18th Century. (8)Key. Appears to be quite early. Possibly dark ages - but if so, in very good condition. (9)Double bullet mould, probably made to case up with a mid nineteenth century double barrelled pistol or an early percussion revolver. English, c.1850. 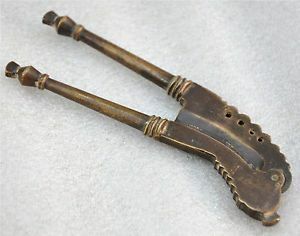 (10)Brass Indo/Persian betel nut cutter, 19th century. 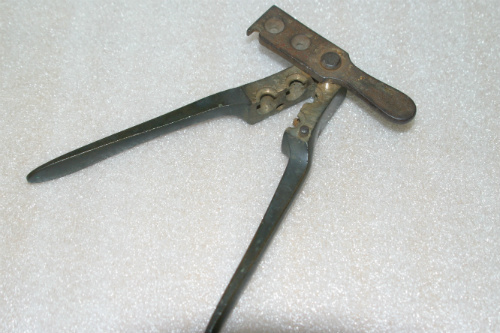 (11)Percussion key/pistol. French(?) circa 1840. Ingenious, but not a serious weapon, in fact I half suspect that all of these key pistols were made more for collectors than for serous users. I have had four of these through my hands over the years - two matchlock, one flintlock, and one (probably the best quality - and the most suspicious) miquelet lock. P.s. I sold all four to members of the trade, and all four buyers were suspicious of their bona fides, but all four were convinced they would sell on - which they did. Excellent work Mike. Only No. 5 fooled you, but not entirely in that at needs it could be used as a nut-cracker. I'll add details later in case any-one else might wish hazard a guess. (5) is not a nutcracker but (on a closer examination) a pincushion holder. The treen screw fitting is to fasten the pincushion to the top of the work table. You have the mechanics of the base and the origin of the whole, it claims to be Dutch C.16th. The top holds not a pin-cushion but a small angled mirror to assist with cosmetic applications probably ~ kohl, antimony, rouge, patches and such like. 1. 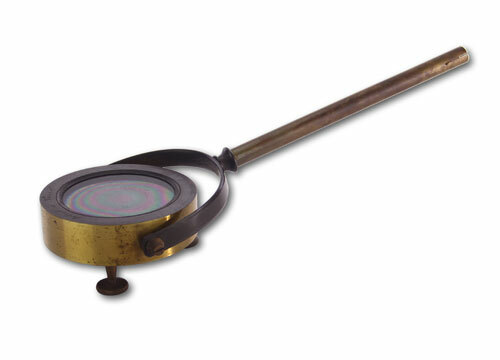 Newtonian ring demonstration device. 3. 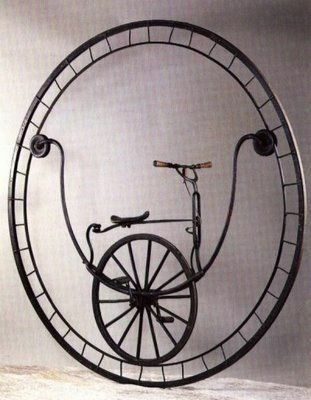 Monocycle by Rousseau of Marseilles 1869 ~ the small wheel allows for a low seat, keeping the centre of gravity low. The large outer wheel provides a smoother ride over uneven surfaces. 8. 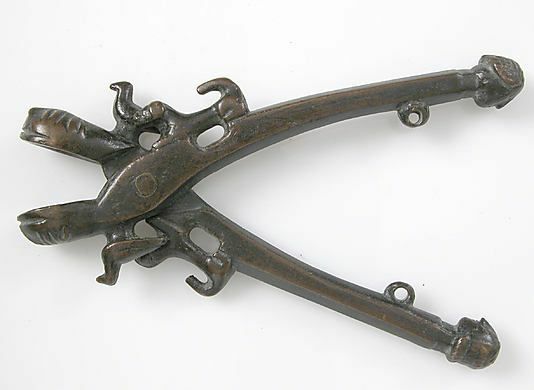 Is catalogued as a Viking period key.